I have no time to post any recipes lately, life was hectic I was working 6 - 7 days a week. This blog has been neglected hopefully you did not miss me much :). Today's recipe is vegetarian, a cheap and cheerful stir fried cabbage with a rather unusual sauce. The secret ingredient is fermented red beancurd or hong fu ru 红腐乳. This recipe looks Sichuanese but I am quite sure it is from Beijing. Fermented beancurd is Chinese cheese. There are various types. All quite salty. 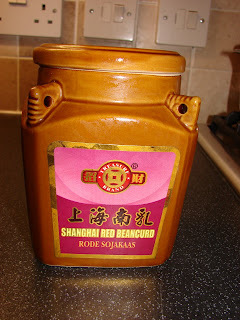 Red type, the deep colour is natural from red rice yeast. Another name for 'hong fu ru' is 'mei gui fu ru 玫瑰腐乳' or rose fu ru. Cantonese normally called hong fu ru as 'nam yue' 南乳. Red fermented beancurd or hong fu ru is normally used for cooking like meat stews or hong shao rou. The white fu ru is creamier some have added minced chilli and/or sesame oil. Normally eaten as a condiment with rice or plain rice congee or juk. Cantonese like to use it as a sauce with chilli and garlic to stir fry kangkong or spinach. Another type of fermented beancurd is the stinky bluish green one which smells really really bad. I can't stand the smell. This is the hong fu ru I normally used. 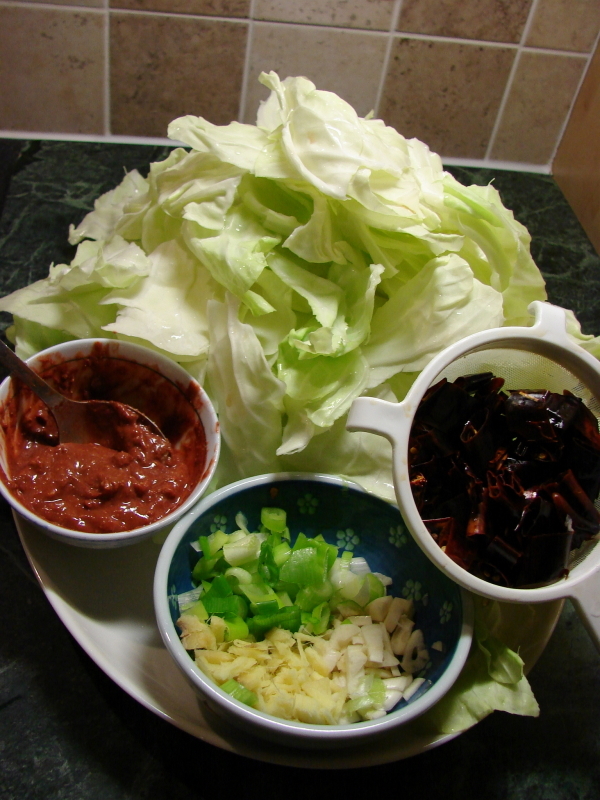 Using hong fu ru for cabbage is rather unusual but it works. This recipe is similar to Chinese leaf with vinegar sauce, only less sharp and more savoury (umami) with the hong fu ru. 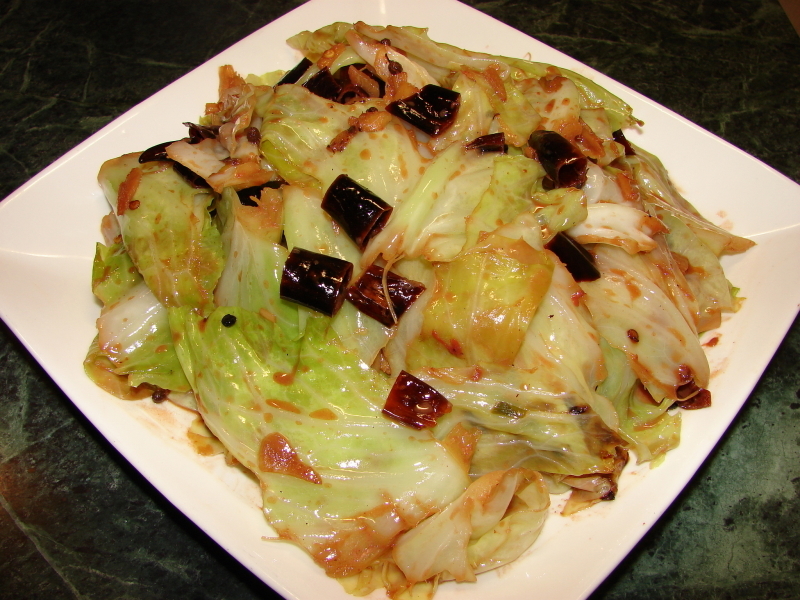 The cabbage is normally not cut by knife but break or torn into small pieces. I was told tearing the cabbage instead of cutting will taste better, I am not too convinced but do as I was told it's up to you if you prefer to cut it. Cabbage is quite plain but it absorbs all the nice fragrance from the spices and the hong fu ru gives it a lovely flavour. I like this recipe hope you will try and like it too. * Cabbage, use normal white, spring cabbage or pointed cabbage. Pointed cabbage is sweeter and takes a lot less time to cook. ** rinsing the dried chillies and Sichuan peppercorns, helps to release the flavour better (IMO) and also prevent them from burning too quickly. Heat the oil till medium hot, throw in the dried chillies and Sichuan peppercorns, stir fry till fragrant. Add chopped garlic, ginger and spring onion. Stir till fragrant. Add cabbage, stir fry for couple of minutes at medium high heat. Then add about 1 tbsp of water to create steam to cook the vegetable. Stir the vegetable. When the water is drying up add a bit more water, continue adding water little at a time till cabbage is tender. Add a splash of cooking wine and the hong fu ru. Stir to coat the cabbage. Add some sugar, taste if not salty add a splash of light soy. Finally before turning the heat off, add a little black rice vinegar. If you like it sharp add more. Good to see you back! I love fermented beancurd. Thanks also for the tip on rinsing the dried chillies — I often manage to burn them so will try this next time.